As auditions ended, X Factor fans continued to take to Twitter to tweet about how much they love Louis. Just a quick scroll of Twitter shows a solid 98% or more of the tweets are positive towards Louis. Aaliya tweeted, “Can’t wait to see @Louis_Tomlinson in thsi whole season of #xfactor2018. With each episode his intelligence and expertise is just shining through. Don’t even wanna start on him as a person cause that guy has his golden heart upon his sleeves.” Some Northern fans has some kind words for their fellow Northerner. 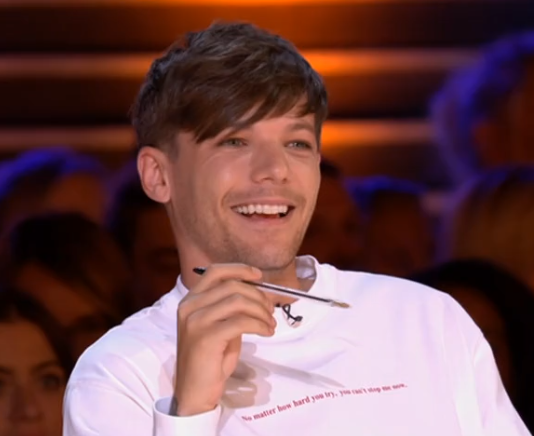 BeautyPR said, “Really impressed with the new judging panel on the #xfactor and @Louis_Tomlinson is such a lovely genuine kind and caring guy #proudtobenorthern”. Louis continues to win over new fans. Carina tweeted, “I genuinely never rated the One Direction lads as individuals before, but Louis is coming across as such a down to earth, kind hearted guy. I hope he gets what he needs from being a judge on the #Xfactor.”. Angelmarie tweeted, “Louis definitely has Some New Fans In My Family Such A lovely Man”. People are really loving that Louis has the Boys category. Adam tweeted, “I’m sorry but Louis_Tomlinson getting the boys is the best things!!! He’ll be such a sick mentor!! !” Jennifer agreed, saying, “Telling ye now a boy is gonna win the @TheXFactor this year they are such a strong category”. Another fan, Kin asked, “Anyone know where the tracksuit Louis was wearing on tonight’s #xfactor is from #NeedIt”. Well, Kin, you’ll be happy to hear fans looked into it and the tracksuit is the Wooyoungmi colorblock track jacket ($615) and track pants ($345). Hope you got a spare $1,000 in your wallet, Kin! Next up is the grueling Six Chair Challenge. Live shows should begin in October and run through early December. X Factor episodes air on ITV at 8 pm on Saturdays and Sundays and on Sundays and Mondays at 8 pm on AXS in the US.